Still working on the writing habit, so what better excuse for a post than to review a book. My mum introduced me to Bill Bryson books and I read some of his travel/cultural writings way back before my emigration (and also his slots on Radio 4, if I remember correctly. I picked this one up from Exclusive Books in Gaborone Sandton City (according to the price label, it’s dated 2011 so probably from when I went on a Civil Designer training course). 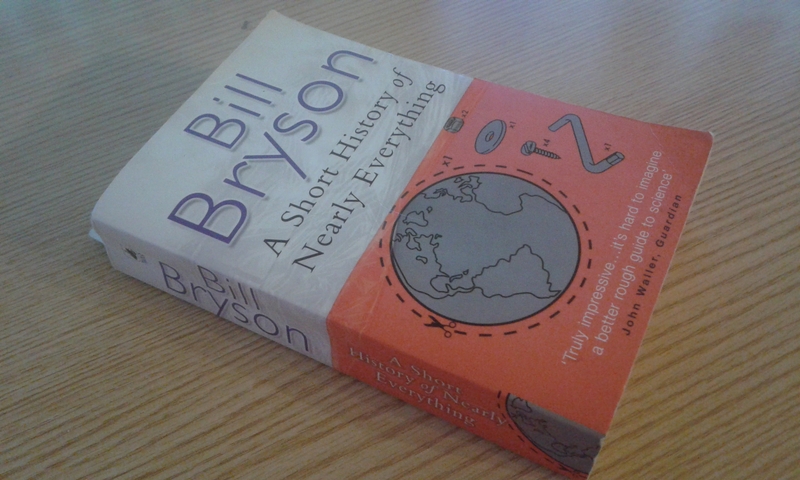 The title of “A Short History Of Nearly Everything” is not quite true, as it is limited to scientific history rather than political. However, if you subscribe to the notion that physics is the root of everything then it’s probably not far off. The book covers the last 2/3 of this graphic. The reader is taken on a gallop through space (just how incredibly vast it is), atoms (how incredibly small they are), life (how incredibly unlikely we are) and geology (it rocks). Bryson weaves the facts of science between the personalities, giving life and context to how we as humans have came to be, and then reverse engineered the universe to see how it all works. It’s fun, educational and enlightening. Describing this is a review was probably over-egging the pudding.